Before Alexander the Great or the Roman Empire, the Persian Empire existed as one of the most powerful and complex empires of the ancient world. 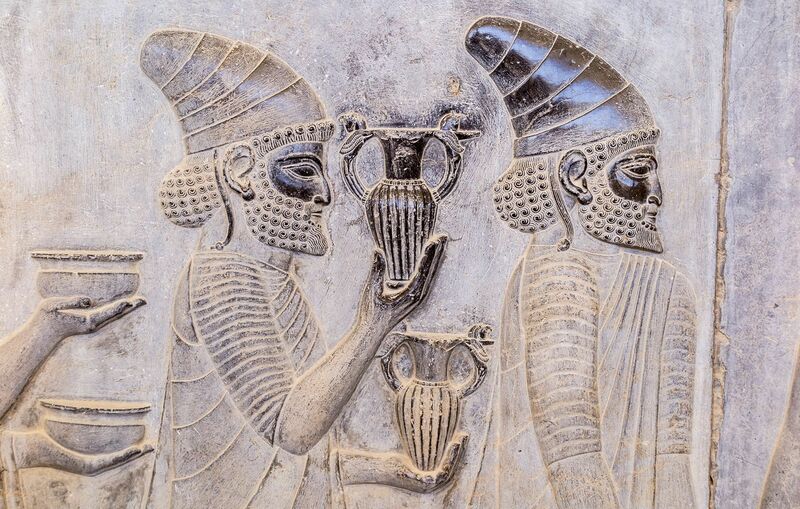 This relief of two figures can be seen in the ancient Achaemenid capital of Persepolis, in what is now Shiraz, Iran. In 1979, UNESCO declared the ruins of Persepolis a World Heritage Site. The Persian Empire, also known as the Achaemenid Empire, lasted from approximately 559 B.C.E. to 331 B.C.E. At its height, it encompassed the areas of modern-day Iran, Egypt, Turkey, and parts of Afghanistan and Pakistan. The Persian Empire emerged under the leadership of Cyrus II, who conquered the neighboring Median Empire ruled by his grandfather. From then on Cyrus was called the “shah,” or king, of Persia. Eventually he was known as Cyrus the Great. Cyrus was unlike other emperors because he showed mercy toward the cities and kingdoms he conquered. He was known to spare the life of a defeated king so that the king could guide Cyrus in successfully ruling over the captives’ subjects. Cyrus also practiced religious and cultural tolerance toward conquered people. Cyrus’s relative Darius I (known as Darius the Great) took the throne after him and built the empire to its greatest height. Darius recognized that such a large area needed to be properly structured and organized in order to function efficiently. He set up a system of provinces and governors, and a postal service that spanned the empire in order to establish widespread communication. Darius also used the tribute money paid to him from each province to fund public works, such as roads and canals. The Persian Empire began to decline under the reign of Darius’s son, Xerxes. Xerxes depleted the royal treasury with an unsuccessful campaign to invade Greece and continued with irresponsible spending upon returning home. Persia was eventually conquered by Alexander the Great in 334 B.C.E. (356-323 BCE) Greek ruler, explorer, and conqueror. empire that dominated Mesopotamia from about 550 to 330 BCE. Most of the ancient Persian empire is in modern-day Iran. structures and facilities, such as roads, paid for by the government. king of Persia or Iran.